The Walking Dead, a show keenly interested in the question of how to create a society after collapse, does not believe in the potential for change or the possibility of a better future. While viewers might imagine themselves, like fiercely independent fan-favorites Daryl and Michonne, thriving best in survival mode, wielding unique weapons and murdering zombies with aplomb, the show continually demonstrates that simply being a badass isn’t enough. Making a community is human nature, but the division into “us” and “not us” starts up almost immediately. When everything breaks down, when family and jobs and traditional ways of creating identity are lost, people still cling to group roles as a way to find something to live for, and as soon as you’ve created a group, you’ve created the other. The grandfather of current zombie cinema and television, George Romero’s Night of the Living Dead, presents us with this tension as soon as the characters assemble in the farmhouse. Should we stay together upstairs and actively face the problem, or should we hole up downstairs and avoid the problem until it is over? Should we work together to help each other, or should we protect “our own” (as defined by family ties or simply who we happened to have arrived with)? How can we trust each other when people are often more dangerous than the zombies? While Romero used zombies as a way to critique the nuclear family, racism, Capitalism, commercialism, and our reliance on, and belief in, the power of the state and the military, among other things, The Walking Dead doesn’t seem interested in larger political or social debate. It attempts, with varying degrees of success, to wrestle with the classic survival horror question: how can we have security and extend humanity to others without risking our lives? Throughout the last four seasons of the show, the main characters (ones who have survived, at least), led by former Sheriff Rick (Andrew Lincoln), have moved from an idyllic farm to a fortified prison to scattered and wandering the wilderness, each group headed for the ominously-named Terminous. Each time the characters try to establish some kind of normality, they are again reminded that normality isn’t possible; the zombie apocalypse means the end of normal. A desperate search for some security inevitably ends badly. Caring for others and letting down your guard means making yourself vulnerable. The constant punishment of the characters for expressing human vulnerability sometimes becomes almost comically bleak. So you thought the season three c-section during zombie infestation and subsequent head-shot to prevent the bleeding mother from turning to a zombie was tough to watch? Try the sword-to-the-neck death of gentle veterinarian and moral compass Hershel after what was supposed to be a rousing speech by Rick about how we can all live together if we try. Or the choice to shoot a pre-teen in the head because she is suffering from delusions and has killed her own younger sister and cannot be trusted with other people. These scenes create tension and interest in the immediate moment but leave the viewer feeling ultimately cheated. It seems to be saying, over and over, that there’s no way to be both safe and to care for others. And if being alone is safer, why even bother surviving if there’s nobody worth risking your life for? The Walking Dead can’t always figure out how to answer this question or make the answers interesting, which means that an episode of The Walking Dead can both be a huge bummer and also incredibly boring. You can gasp at the horrific deaths and well-orchestrated zombie hoards, but beyond that, what is there to care about when the show ultimately seems to be arguing that caring isn’t worth it and doesn’t bother to establish characters with rich emotional lives? This constant fluctuation between community and love and self preservation could be compelling if every character was clearly struggling internally with this question, too. The trouble is that most of the characters lack much beyond a stock motivation or single personality trait. Lori and Andrea were famously despised, inconsistent characters whose roles were primarily to create trouble for more fleshed-out characters, but this problem infests the entire show: some of the characters are simply devices to move plot points, or, even worse, single-minded and focused on one goal, person, or desire in ways that do not ring true to the complexity of human experience. Who is Glenn, for example, aside from a guy who is in love with Maggie? And who is Maggie, except a girl who has a terrible Southern accent and is in love with Glenn? Have we learned anything about Beth except that she can sing a damned fine acapella version of a Tom Waits song? What about characters like Tyreese, Sasha, and Bob, who are given very little to work with beyond “your character wants to survive” or “your character has a drinking problem” or “your character is angry”? The show does well when it lingers on individual characters played by actors strong enough to make up for the lack of good writing. Daryl (Norman Reedus), the crossbow-weilding, motorcycle-riding drifter gets two season-four episodes devoted entirely to his story as he treks across the forest with Beth. 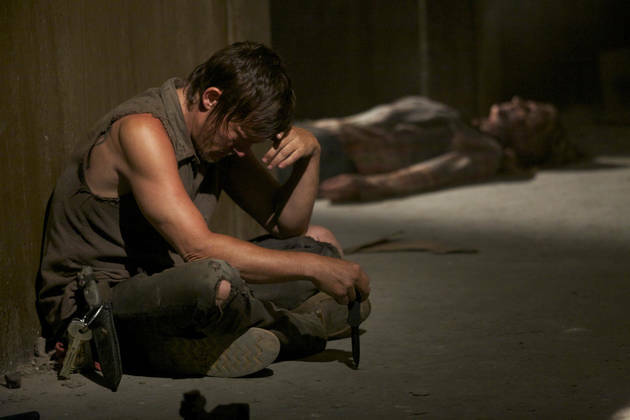 In these episodes, we learn some things that we might have already suspected: that Daryl is a follower, that he wasn’t doing much of anything interesting before the zombie apocalypse except tagging along with his older brother, and that he grew up in an abusive, poor home. These are not exactly revelations, but they add something to Darryl’s struggle later in the season when he loses Beth and joins up with a gang of men who resemble his brother Merle (who was not only an all-around jerk, but also a racist and a murderer) and promise to make him part of a family again. Still, Daryl remains wary, unwilling to commit himself to any group completely. Reedus plays Darryl precisely, and his physical choices convey more about Daryl’s character than any of the lines of exposition do. Daryl hangs back from the group, always braced for action. His eye contact is evasive. He conveys a physical strength coupled with absolute uncertainty that anybody really wants him there to begin with, which make his character compelling. Michonne (Danai Gurira), too, is an interesting character. Like Darryl, she’s a survivor who is always somewhat separate from the group, and her entrance as a swordsman leading de-armed and de-toothed zombies on a leash made her memorable, even if she barely had lines in season three. In season four, we are finally given glimpses of Michonne’s past life as well as some sense of her as more than a stoic killing machine. In one particularly effective flashback/dream sequence, we see a beautiful and happy Michonne, her young son, her partner, and a friend discussing a play (“It was a bit pedestrian,” she says). 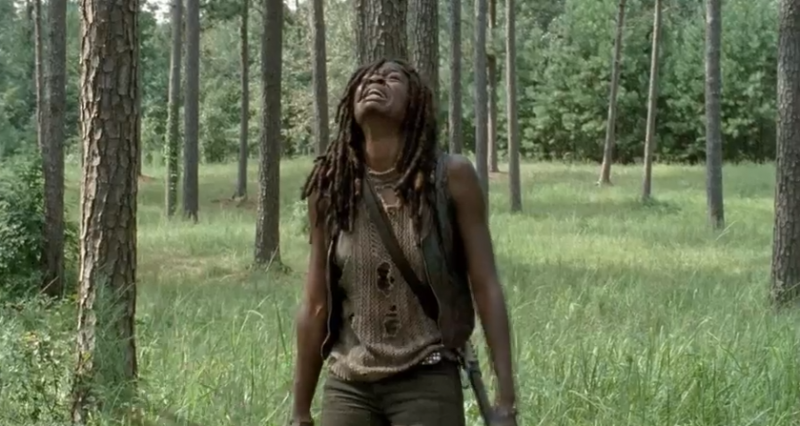 The scene quickly changes, though, to the characters discussing whether or not they should go to a “camp” to avoid the zombies and a final shot of the two men armless, Michonne’s son gone. It’s not exactly clear what happened, but we understand that Michonne’s son is dead and these two men, who were once a friend and a lover, respectively, were somehow responsible. 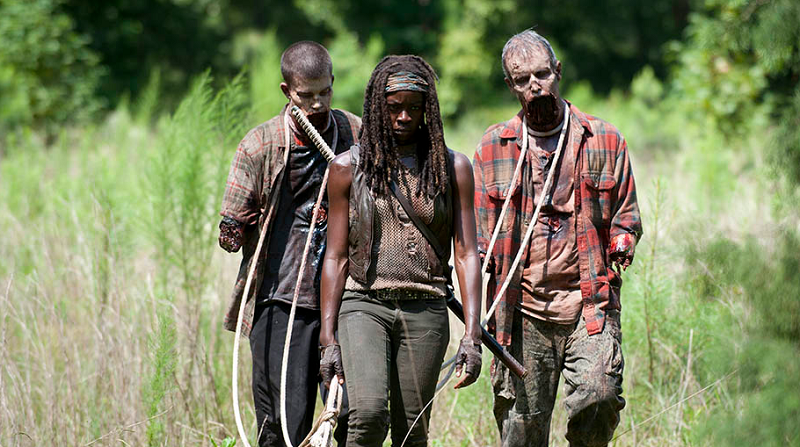 Unlike Daryl, Michonne has had a positive, almost idyllic “regular life” before the zombies. The Michonne we see at the end of the world makes sense in context, and it is almost heartbreaking to see her allow in some vulnerability as she grows closer to Rick and Rick’s son Carl; it’s painful to imagine what else she could lose. 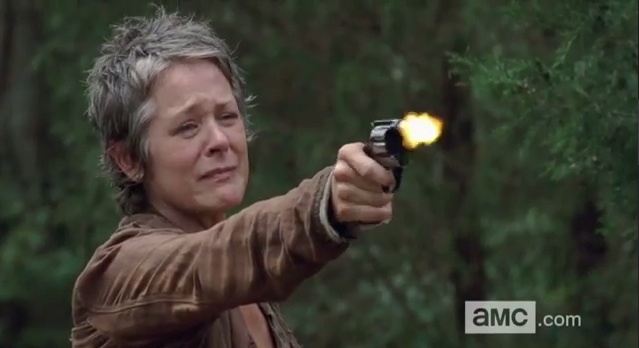 Lastly, Carol (Melissa McBride) has shown the most dynamic growth of any character in the show. She went from a battered wife and mother in season one, painfully cowering under the physical and psychological power of her husband, to a grieving mother after her daughter is revealed to have been “turned” and has to be killed, to a character who is determined to move forward and survive, who can make relationships and be part of a group but can also be relied upon to do the things that other people cannot do. But she also takes this too far and is eventually banished from Rick’s group for killing two group members who were ill with a deadly flu virus. Carol’s ambiguous morality, and how she earned it, make her a rare character capable of surprising the viewer. When these three characters face the question of caring and vulnerability versus survival, the audience is interested, because we know who they are and their choices have some emotional impact. You can say, as some people have when I write about this show, that it’s a zombie show, that I shouldn’t take it so seriously. But claims like this go against everything the show is trying to do, all the way back to the excellent pilot, and it also shortchanges the viewers, who, like my husband’s students, use shows like this to work through their own hopes, anxieties, and sense of personal identity. 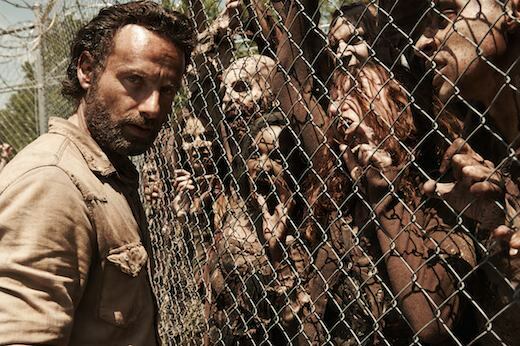 The Walking Dead is obsessed with meaning and how to make it. I want The Walking Dead to consistently be the show it hopes to be and sometimes achieves in its best moments. Far more effective than easy shock and bloody set-pieces are the quieter moments of the show, such as Daryl’s hopelessness after he loses Beth’s trail, Carol’s face when she is confronted with the question of how to deal with a mentally ill and dangerous child, and Michonne breaking down when she is asked to hold a baby. Don’t get me wrong. I love a sudden zombie hoard and tragic turn of events as much as the next person, but there needs to be something under the surface to make me care. All too often, The Walking Dead dazzles visually, but forgets to lay a foundation to make all that blood and misery mean something. LETITIA TRENT’s work has appeared in Sou'Wester, The Adirondack Review, The Denver Quarterly, The Black Warrior Review, and Fence, among others, and her essays on film regularly appear in the online film journal Bright Wall in a Dark Room. Her chapbooks include You aren't in this movie (dancing girl press) and Splice (Blue Hour Press). Her first full-length poetry collection, One Perfect Bird, is available from Sundress Publications. She was the 2010 winner of the Alumni Flash Writing Award from the Ohio State University's The Journal and has been awarded fellowships from The Vermont Studio Center and the MacDowell Colony.